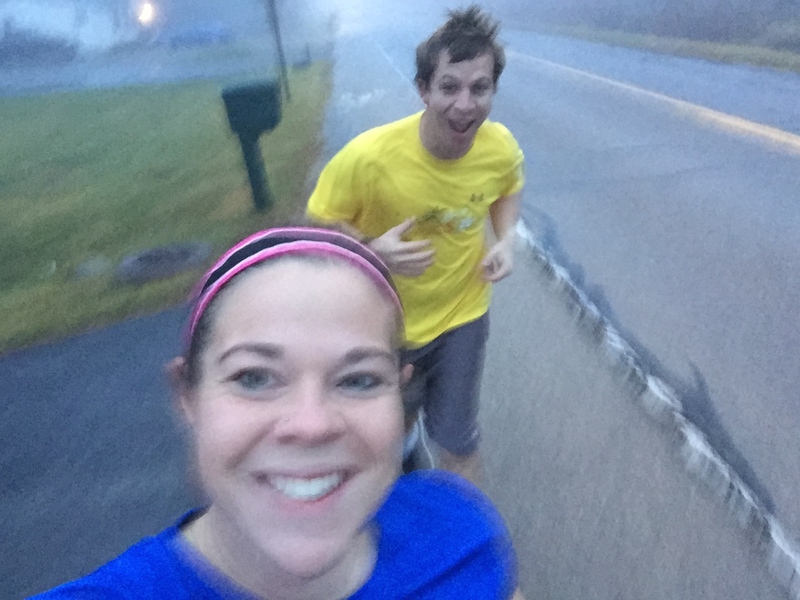 Runs for Cookies: Old friends! This morning, I woke up feeling a little hung over, but I have to say--it was totally worth it for the fun I had last night! Once a year, at Christmastime, my childhood friends come over for a get-together. I grew up in a neighborhood that had a lot of kids my age (mostly boys), and we were all very close friends. We used to play sandlot baseball every morning at 7:45 during the summers when we were kids. 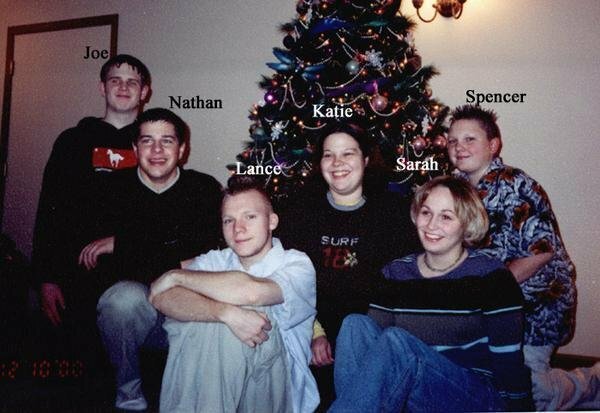 There was my best friend Sarah (now living in Arizona) who lived just a couple of houses down from me; Lance, who lived behind me, and who Sarah and I used to fight over; Spencer, Lance's brother; Joe, Sarah's younger brother, who was always in some sort of trouble; Mike and Brian, who lived next door to me (Brian now lives in L.A.); Chris and Matt, who lived a block over; and of course, my brother, Nathan. Joe is sort of a "drifter", and since Sarah and Brian live out-of-state, it's rare that we all get together. Mike and Lance recently bought a bar together, and unfortunately, Mike had to work all day yesterday, so he wasn't able to come. Chris's son had the flu, and his baby-sitter canceled, so he wasn't able to make it yesterday, either. It ended up being Sarah and her husband, Ne; Nathan and his girlfriend, Kendall; Joe; Lance, and his girlfriend, Amanda; Jerry; and me. We had dinner (pulled pork sliders, cheesy potatoes, Caesar salad, and buffalo chicken dip), and then did a white elephant gift exchange. We'd never done the gift exchange at our get-togethers before, and it was totally last minute, but it was fun! 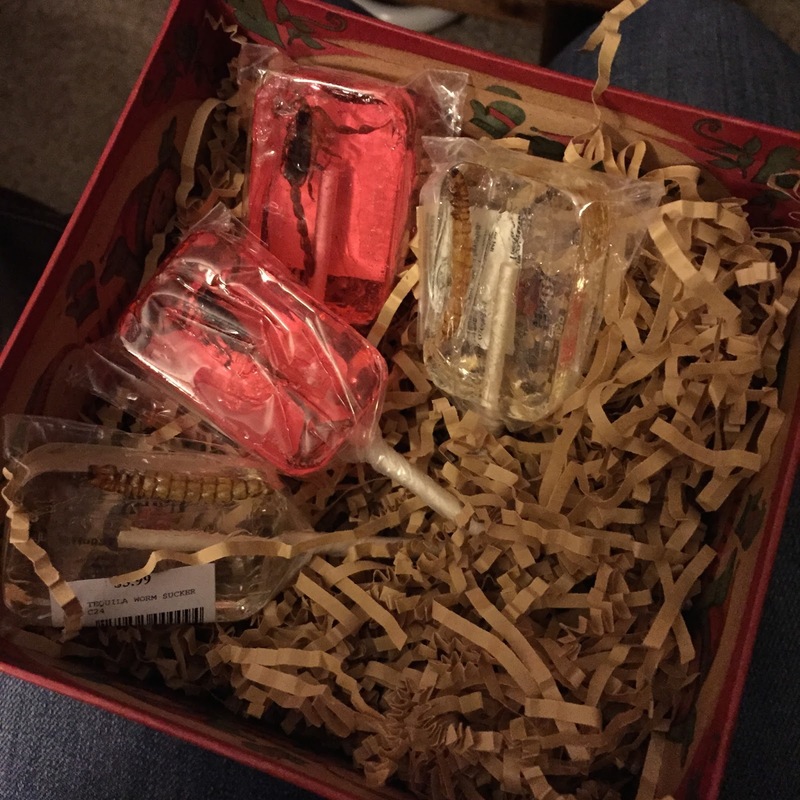 I wound up with Sarah's gift, which was some suckers with worms and scorpions in them--I knew my boys would love those. Then we got down to business and played Apples to Apples, followed by Guesstures. My cheeks hurt from laughing so hard--that game never gets old! My friends always hate playing games with Sarah and I on a team, because we can pretty much read each others minds. (I will never forget one time when we were playing a game where Sarah had to describe a word to me, and she said, "Falling off a cliff..." and I shouted out, "MacGuyver!" --and it was correct. Hahaha, everyone thought we had to have cheated, but we just know each other very well ;) Anyway, I never stay up late, but before I knew it, it was 1:30 in the morning when everyone started heading out. I went to bed at 2:00, and then woke up at 7:00. 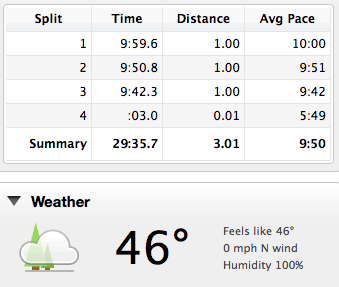 I'd had several beers last night, and my stomach was feeling kind of icky when I woke up, but I decided to go for a run before heading to Weight Watchers. Jerry got up and went with me. 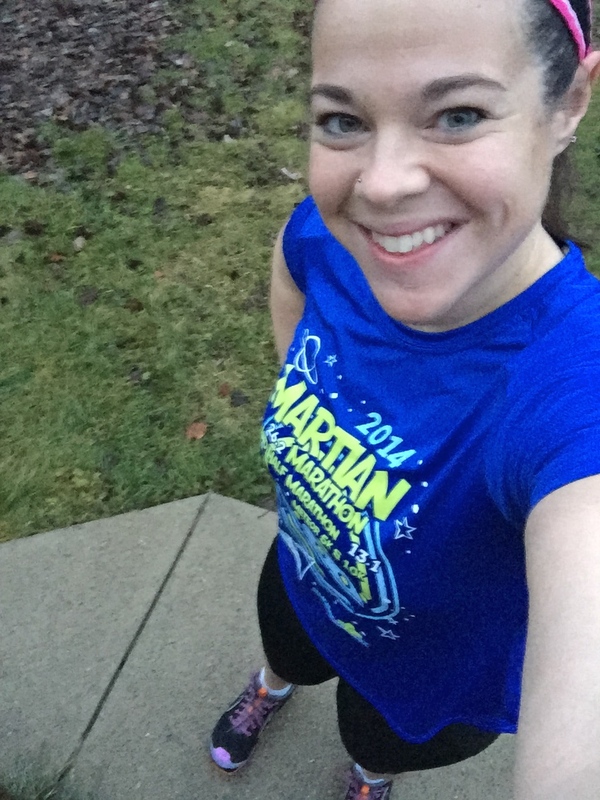 It was kind of crazy--I wore capris and a t-shirt, for a run on Christmas Eve in Michigan! Normally, you can see the lake really easily right there, and looking across, you can see the peninsula, but it was so foggy we couldn't see anything. You could tell both of us were pretty tired, because we didn't talk much, but it was nice to get out and run off the beer (well, a little of it, anyway). We just did three miles, because I had to get home and shower before going to Weight Watchers. I took a quick shower and then went to my meeting. I wasn't expecting much from my weigh-in, especially after yesterday's eats/drinks, but I managed to lose 0.7 pounds this week. April was at the meeting today, and I was so glad to see that she's still going! She said right before I walked in, she and another member were just asking about what happened to me and where I've been. This coming week should be better as far as being on-plan, because I don't have much going on. Tonight, I'm going to my aunt's house for dinner, but I've planned out my PointsPlus ahead of time. Tomorrow is going to be VERY low-key, and I'm super excited! The kids will open gifts in the morning, and we aren't going to leave the house at all tomorrow. We'll stay in pajamas all day, maybe watch a movie or two, play some games with the kids, and just have a very relaxing day. Sounds like you had a blast getting together with old friends. Merry Christmas Katie! By the way, did you get new shoes?? Those look different that your altras? Merry Christmas to you and Mandy, Dean! The shoes in this pic are actually the Altra Torins. Golden suggested I alternate my shoes, and I like my Paradigms so much I decided to try the Torins as well. I can't really decide which I like better! Merry Christmas Katie. Thank-you for the months of great blogs! I wish you the very best for the new year. I hope you and your family have a very Merry Christmas!!! Thanks for sharing your thoughts and experiences with us. Looking forward for the next! keep it up! Katie, you look so TINY in the picture of you and your friends. Merry Christmas (even though it was yesterday) and happy happy New Year!